Spring of 1943. Poland remains occupied by Nazi Germany. Communication between the Polish underground and Polish military authorities in London is difficult. The sending of intelligence mail by courier through France took several months. The use of Swedish businessmen, travelling from Stockholm to Warsaw, to pass on mail had by the autumn of 1942 been blocked. Jan Nowak, working for the Polish resistance, volunteered to try and re-establish a courier route from Poland to Sweden. It was known that Polish workmen who loaded boats had managed to stow away to Sweden. The Gestapo knew this too and searched every vessel with dogs before it was allowed to set sail. Any attempt to stow away would be dangerous and if found by the Gestapo torture and execution awaited. Jan Nowak was 26 years old when war broke out in 1939. As a reserve soldier he reported for duty with his regiment the Second Squadron of Horse Artillery. On September 15 they engaged the enemy in the vicinty of a village called Uscilug on the river Bug. Nowak was eventually captured by the Germans but later escaped and made his way to Warsaw. By 1941 he was working for the Polish resistance in a cell called "Action N". Their function was to produce literature which appeared to have been written by a German military underground organisation and then distribute it where Germans would find it. The intention was to demoralise the Germans and encourage the Poles. Nowak's task was to establish a courier network which would distribute the material to the western provinces of Poland and into the German Reich itself. By the spring of 1943 he had the idea of setting up distribution centers in the Baltic ports of Gdansk and Gdynia so that the literature could be placed on German warships and also supplied to Swedish sailors. It was then he learned about the Poles who had stowed away on ships to Sweden. In April 1943 Nowak left Warsaw for the port of Gdynia. He had an identity card as a workman, in the name of Jan Kwiatkowski, which enabled him to enter the dock area. A crane operator, called Franek, helped smuggle him on board a Swedish ship where he hid in the hold which was full of coal. On April 20 the ship set sail. The journey to Stockholm would take three days and eight hours. After half that time the ship's engines stopped. The hold hatch cover was removed and Nowak revealed himself to the Swedish sailors. He was not in Stockholm but on the Swedish island of Gotland. Eventually he was taken to Stockholm and to the Polish legation. His journey from Warsaw to Stockholm had taken 24 days. Jan Nowak made five journeys as a courier. The table below gives the details. Warsaw to Sweden 11 April 1943 departure from Warsaw; 5 May 1943 arrival in Stockholm. Swedish ship from Gdynia (Poland) to Island of Gotland (Sweden). Sweden to Warsaw 21 June 1943 Swedish ship from Luleo most northerly port in Sweden; 29 June 1943 arrival in Szczecin, Germany. A few days later arrival in Warsaw. Warsaw to London 15 October 1943 - 7 November 1943 arrived in Stockholm; Swedish ship from Gdynia (Poland) to Malmo (Sweden). Flight in small bomber from Sweden to Scotland, then train to London. London to Warsaw 11 July 1944 flight from London via Gibraltar and Algiers to Italy; Flight from Brindisi (Italy) to Poland; 26 July 1944 arrival in Warsaw. Warsaw to London Left Warsaw at end of Uprising in early October 1944; Waited for air transport through all of October, November and into middle of December. Eventually on 19 December 1944 decided to leave overland for London, via Germany, Switzerland and France. On 23 January 1945 arrived in London. Nowak's return to Warsaw in July 1943 coincided with what became known in Poland as the "Black Week". On June 30 the Gestapo arrested General "Grot" (Stefan Rowecki), the commander of the Home Army (AK). On 4 July General Sikorksi, Polish Prime Minister and Commander-in-Chief of the Polish Armed Forces, died in an air crash at Gibraltar. He had been returning to Britain from a visit inspecting Polish troops in the Middle East. Poland had lost two of its most important leaders in a single week. Nowak was instructed to gather political and military intelligence in London and to influence British decision makers on the value of the Home Army so that they would increase arms drops to them. His return to Warsaw was delayed until late July 1944 due to an accident he sustained when undertaking parachute training. On 29 July 1944, just two days before the start of the Warsaw Uprising, he reported to General "Bor" and the Home Army leadership on his visit to London. At 5pm on 1 August 1944 the Warsaw Uprising began. On that day the Polish flag was once again raised. Nowak had a new task as editor of English programs for the Warsaw Uprising broadcasting station "Lightning". He broadcast news and reports from the city and composed appeals directed at people of influence in England. From 9 August, until the surrender to German forces on the 3 October, 57 English programs had been broadcast. During the Uprising when the end seemed imminent Jan Nowak proposed to his future wife, Jadwiga Wolska "Greta", that they get married immediately. On 24 September General "Bor" gave instructions that Jan Nowak and his wife were to take a collection of documents - the archives of the Uprising - to London. They set out for London on 19 December 1944 from Greta's parents house in Cracow. Jan Nowak and his wife arrived in London on 23 January 1945. Publisher - First published in Polish as Kurier z Warszawy by Odnova, London, in 1978. First english language edition was published in 1982 by Wayne State University Press, Michigan, USA. 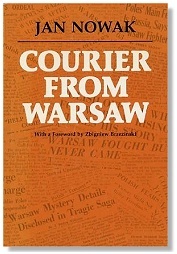 ...when he was a courier for the Polish Home Army - the underground resistance - Nowak-Jezioranski travelled across Nazi-occupied Europe to London to brief personally Winston Churchill and his Foreign Secretary Anthony Eden about conditions in Poland, and bring news of the extermination of the Jews...Nowak-Jezioranski built up a legendary reputation. His was perhaps the best-known voice in Poland during the Cold War. When the collapse of Communism made it possible for him to return home in 1989, his arrival at Warsaw Airport was greeted by the entire senior leadership of Solidarity, the newly triumphant pro-democracy movement, and by a crowd of several thousand well-wishers. This page was added on 22 September 2009.